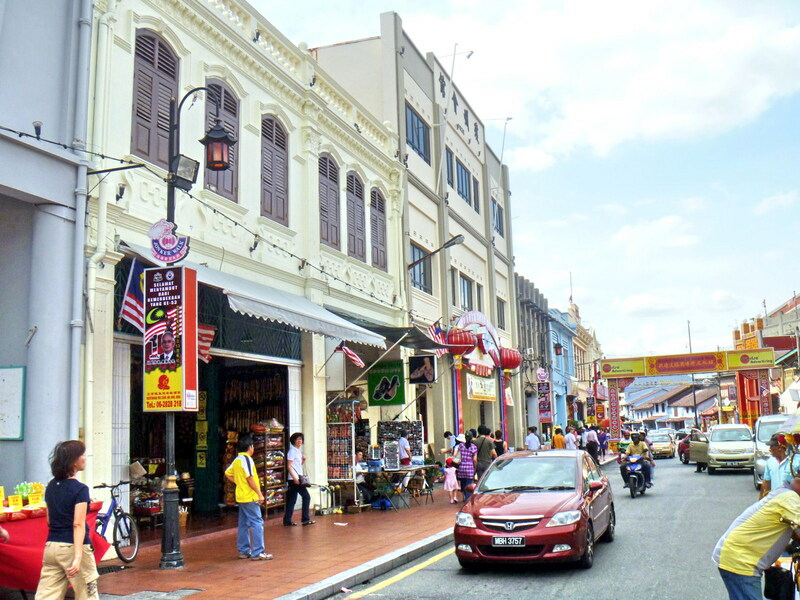 The last leg of our walking tour, prior to our return to our tourist bus waiting for us at the Tamil Methodist Church, was all shopping at the narrow but busy Jonker Street (Jalan Hang Jebat). 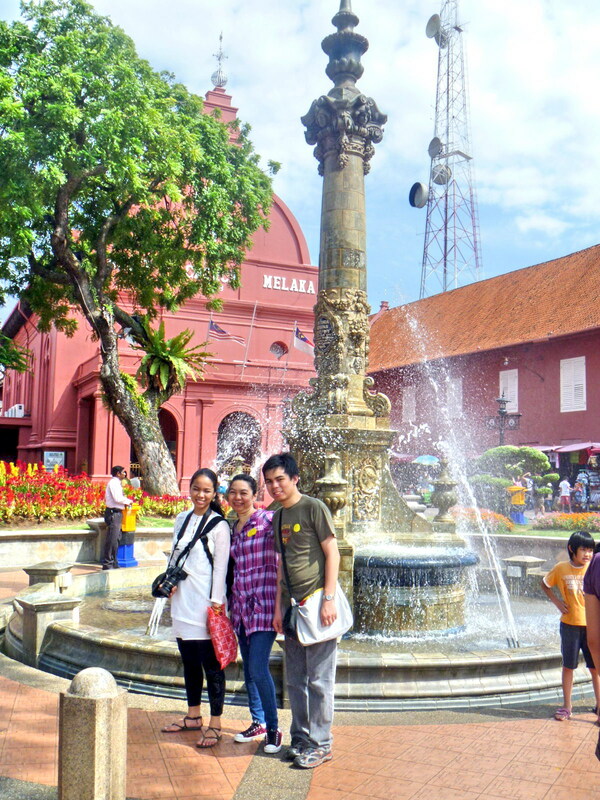 From Stadthuys, we crossed a bridge over the Melaka River to get there. 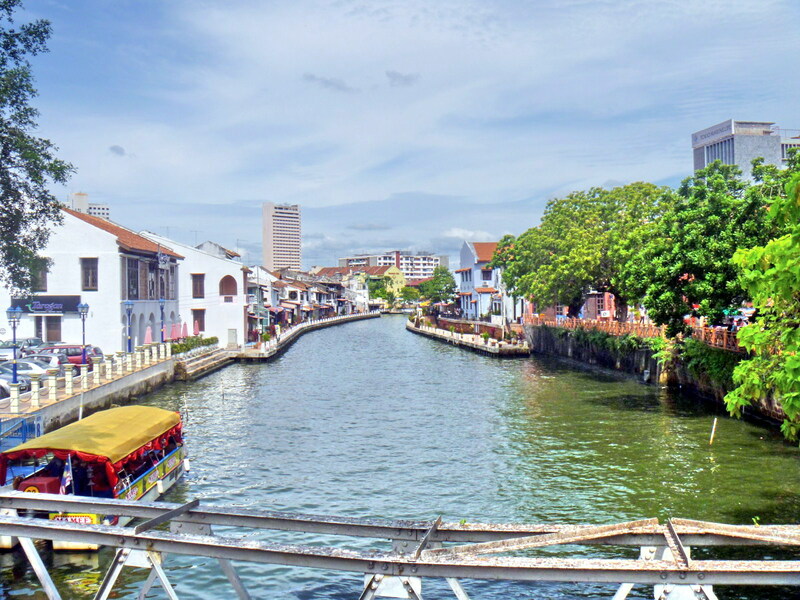 The Melaka River is now canalized to resemble an Amsterdam (Netherlands) canal, with a popular river cruise service running along the river. 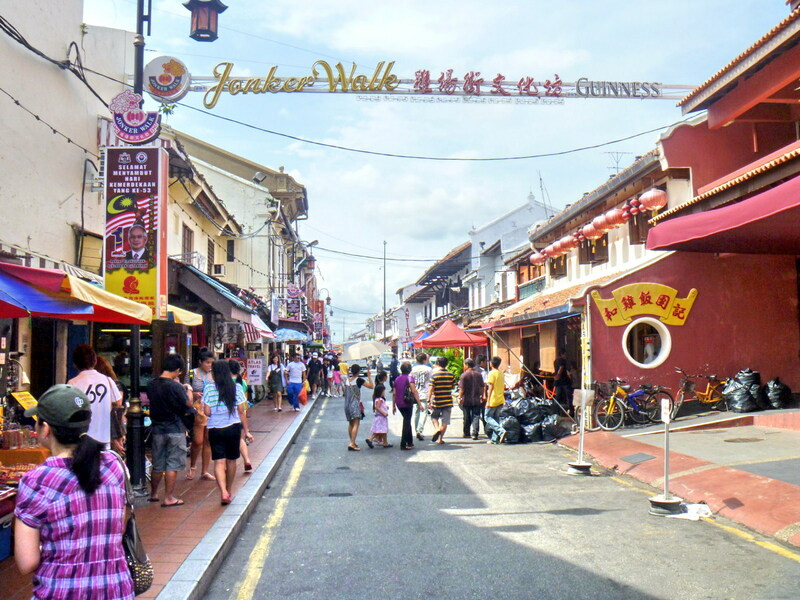 Once the rich man’s street, Jonker Street is famous for its more than 15 antique shops (antique furniture, Chinese porcelain, brassware, cast iron beds, lamps, etc.). 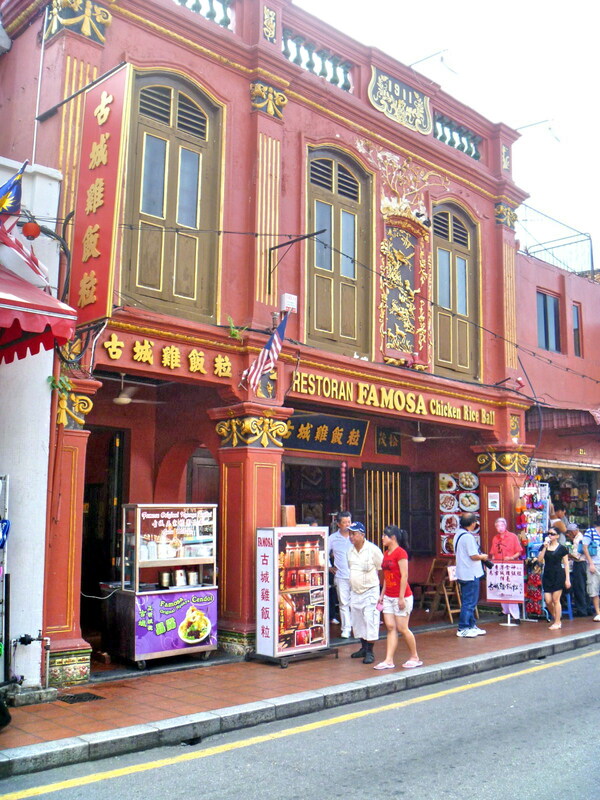 Also along this street are cafes (Hai Nan coffee, Nyonya cuisine, beer, etc. 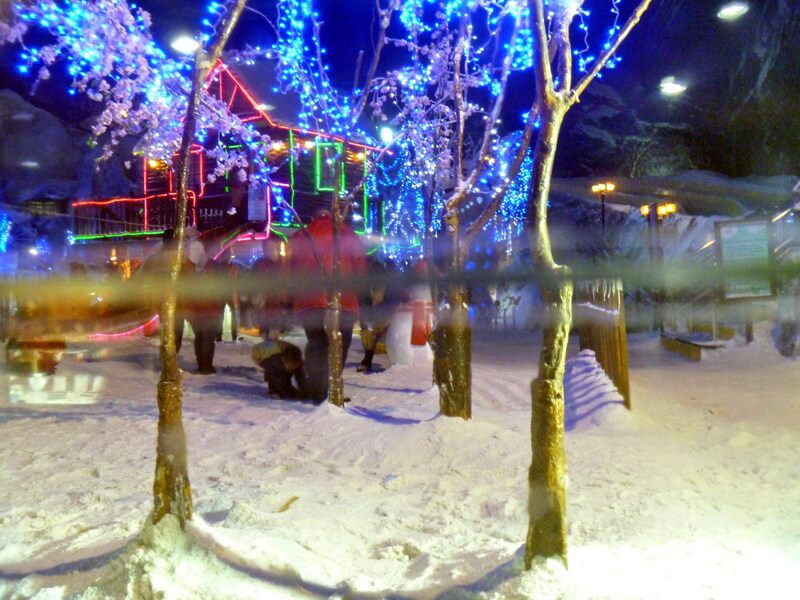 ), several art galleries, mini-markets and souvenir shops among others. 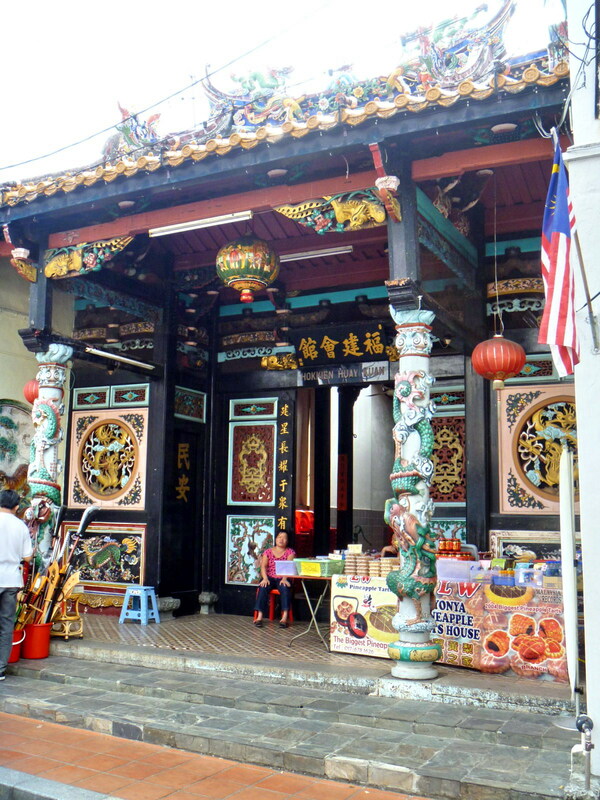 Souvenirs sold here include items made in Melaka, China and other Asian countries (Thai puppets, Balinese masks, etc). Local food stalls sell local delicacies such as cendol (a cold mixture of coconut milk, brown syrup made from the local gula melaka, and shaved ice), laksa (spicy noodle soup), durian puffs, grapes-dipped in chocolate, caramel encrusted kiwis. kaya (a spread made from coconut) filled waffles, etc. The festively-decorated Restoran Famosa, occupying a century-old former goldsmith shop, specializes in dishes served with unique chicken rice balls, actually Hainanese Chicken Rice in the form of golf ball-sized, sticky rice balls cooked in butter and ginger. Pedestrians here share the same road with passing vehicles and trishaws during daytime but, during weekend night markets (6 PM-12 midnight, Fridays, Saturdays and Sundays), the road is closed to traffic and its atmosphere turns carnival-like. 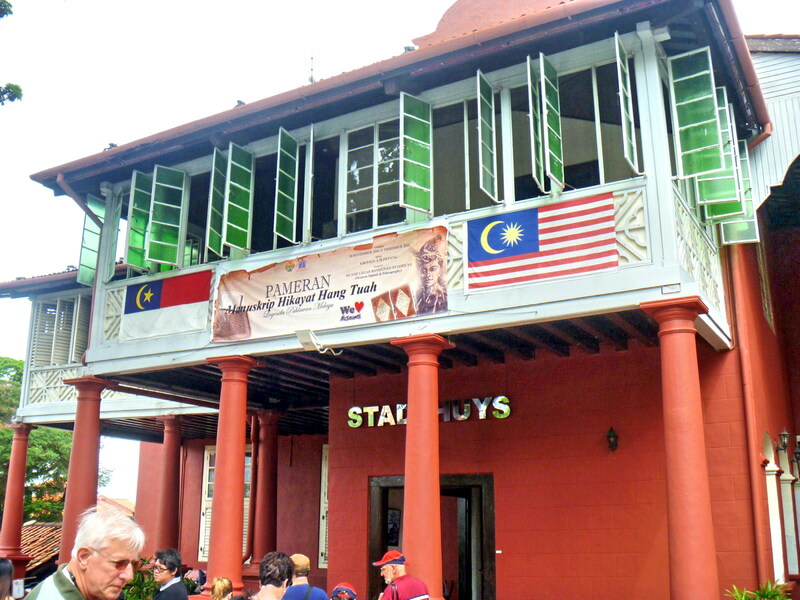 A living proof of Melaka’s rich Baba-Nyonya heritage, its buildings are immaculately constructed with elaborate carvings on its pillars and walls. Also along this street is the Hokkien Huay Kuan, a well-preserved clan house. Its front porch has a pair of symmetrical pillars with dragon relief. Beyond it are a striking set of door and wall panels with intricate carvings and bold colors. Two rows of Chinese characters frame the entrance door. From the ruins of the Church of St. Paul, we went down St. Paul’s Hill, to picturesque and postcard pretty Dutch Square (also called Red Square). Along the way, we passed the Democratic Government Museum (Muzium Pemerintahan Demokrasi), formerly Melaka’s State Legislative Assembly building. At the square, the port-red theme (originally painted as white, it was repainted as such in 1911) predominates with the buildings around the square as well as the Tang Beng Swee Clock Tower (also called the Red Clock Tower, it was erected in 1886 to honor the generous Chinese tycoon Tan Beng Swee). The massive Stadthuys, built between 1641 and 1660, is a reproduction of the former Stadhuis (town hall) of the Frisian town of Hoorn in the Netherlands which existed from 1420 until 1796. This building was the official residence of the Dutch governor and his deputy. Believed to be the oldest Dutch building in the East, this preserved example of original Dutch architecture has solid doors and louvered windows. 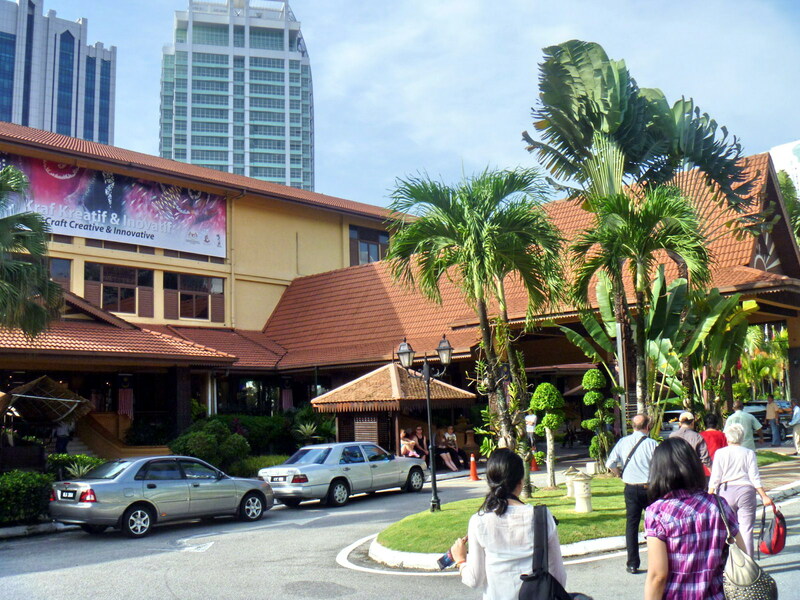 Now the Museum of History and Ethnography (converted as such in 1982), it exhibits traditional wedding clothes and artifacts of Melaka, dating back to its days of glory. 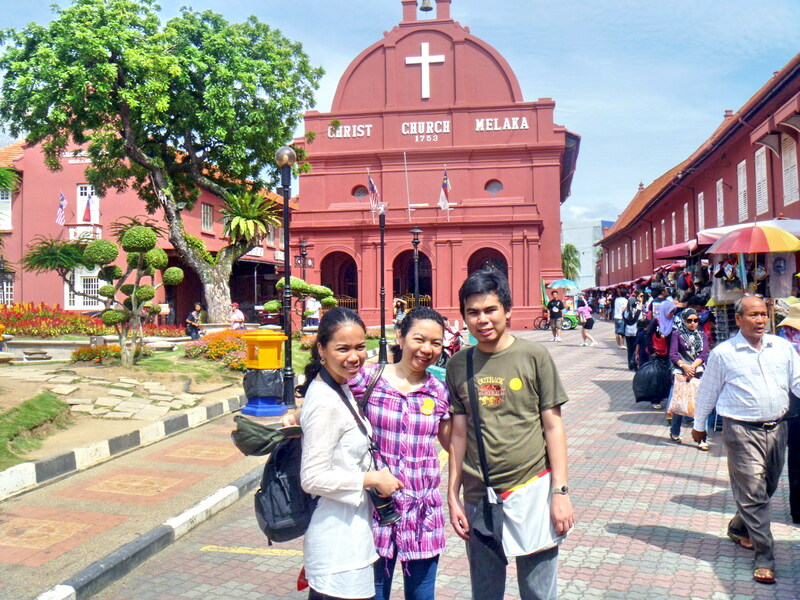 Nearby is Christ Church, the oldest functioning Protestant church in Malaysia. Built in 1753, in the Dutch Colonial architectural style, as the Bovenkerk (High Church), the main parish church of the Dutch Reformed community, it was re-consecrated in 1838 with the rites of the Church of England and renamed Christ Church. 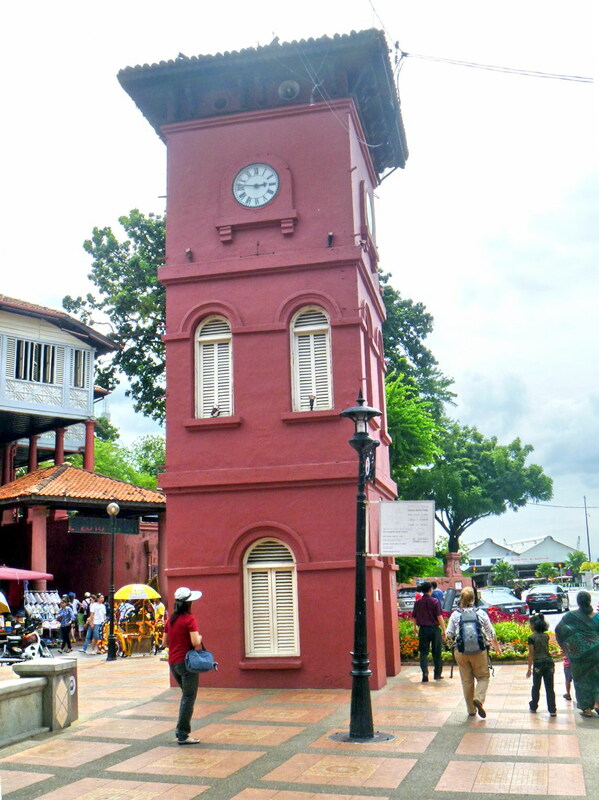 After the British takeover of Malacca, its original Dutch windows were reduced and ornamented. The porch and vestry were built only in the mid-19th century. This church, measuring 25 m. (82 ft.) by 13 m. (42 ft.), has a roof covered with Dutch tiles, walls of brickbuilt on local lateriteblocks then coated with Chinese plaster, and floors paved with granite blocks originally used as ballast for merchant ships. Inside are hand-crafted church benches, joint-less ceiling skylights, a copper replica of the Bible, a headstone written in the Armenian language and a replica of “Last Supper” made with glazed tiles and located over the altar. Its 12 m. (40 ft.) high ceiling has 15 m. long beams made from a single tree. Between the two buildings, right in the middle of Dutch Square, is the Queen Victoria Diamond Jubilee Fountain, probably one of a few functioning colonial water fountains in Malaysia. Erected in 1904 with English marble, it commemorates the queen’s 60th anniversary (Diamond Jubilee) on the British throne. 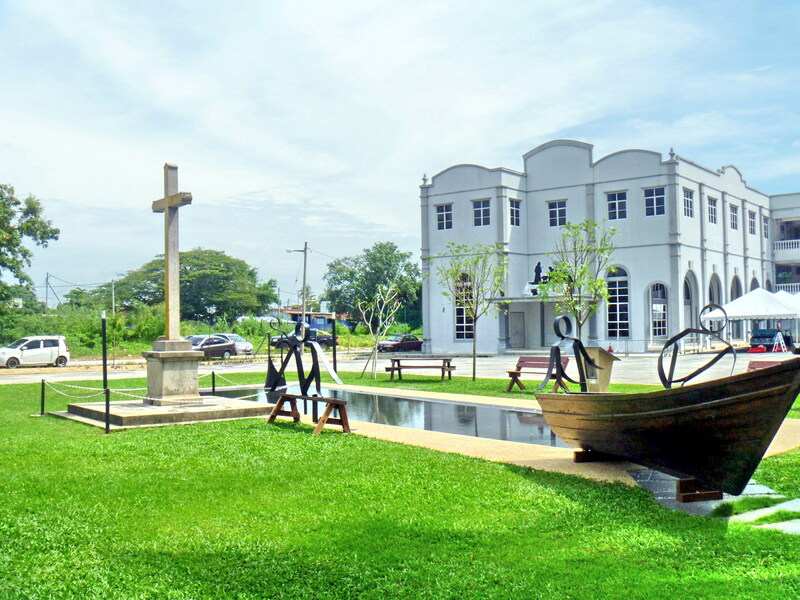 The Malaysia Youth Museum & Art Gallery (Balai Senilukis Melaka), between Christ Church and Laksamana Road, was built in 1784 as the Dutch Administrative Complex. 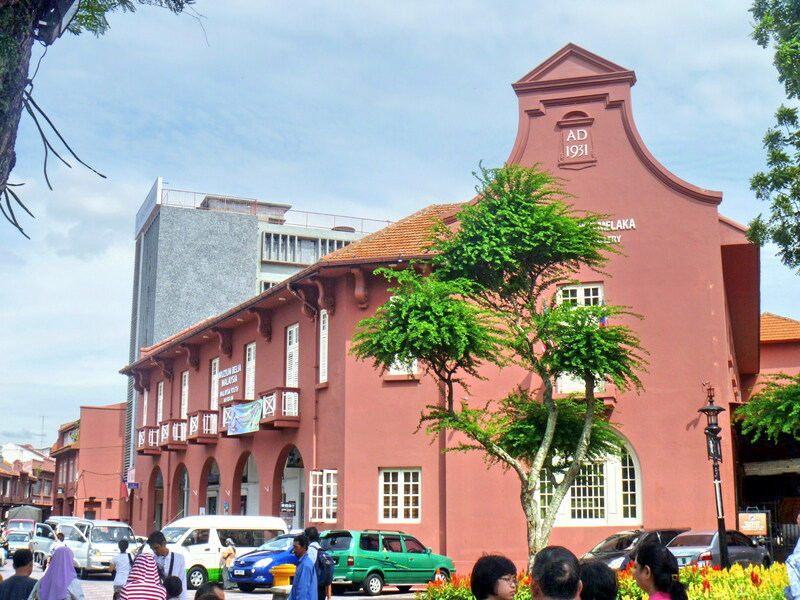 In 1826, it was converted into the Malacca Free School and, in the 1920s, was renovated to be a 2-storey building to be later used as a post office before conversion into a museum. 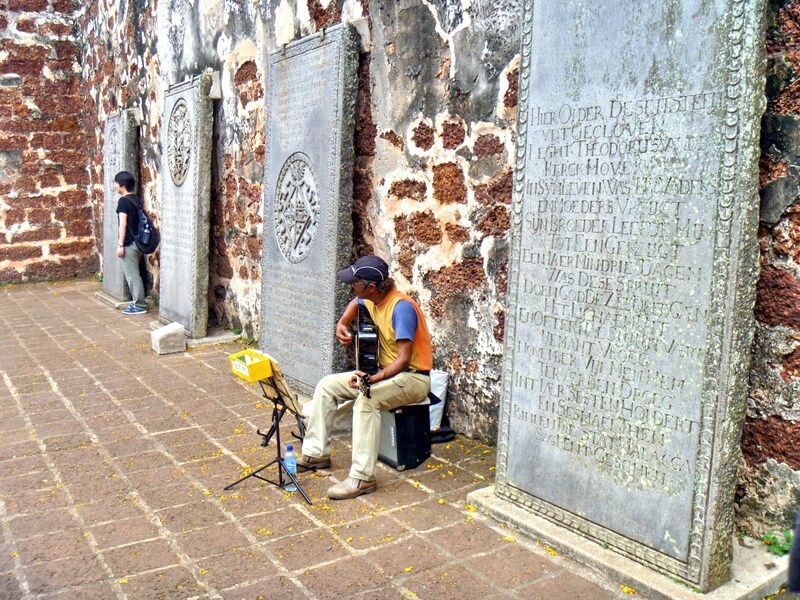 From Fort A’Famosa and Porta da Santiago, we next hiked up a steep, 110-step paved stairway to the summit of St. Paul Hill (formerly called Malacca Hill) where the roofless ruins of St. Paul’s Church can be found. Built by Portuguese Capt. Duarte Coelho in 1521, it was formerly called the Chapel of Madre de Deus (Mother of God) and Nossa Senhora do Oiteiro (“Our Lady of the Hill”). The Portuguese enlarged the chapel in 1556, adding a second storey to it. Further renovation was carried out in 1590 with the addition of a tower. A burial vault was opened in 1592 and many people of distinction were buried there, including Pedro Martins, the second Bishop of Funay (Japan). The body of St. Francis Xavier, a missionary who came to Melaka in 1545, was temporarily interred here in 1553 before it was taken to Goa (India) after 9 months. In front of the church stands a huge, pearl-white statue of the saint, erected in 1952 in commemoration of the 400th anniversary of his sojourn in Malacca. 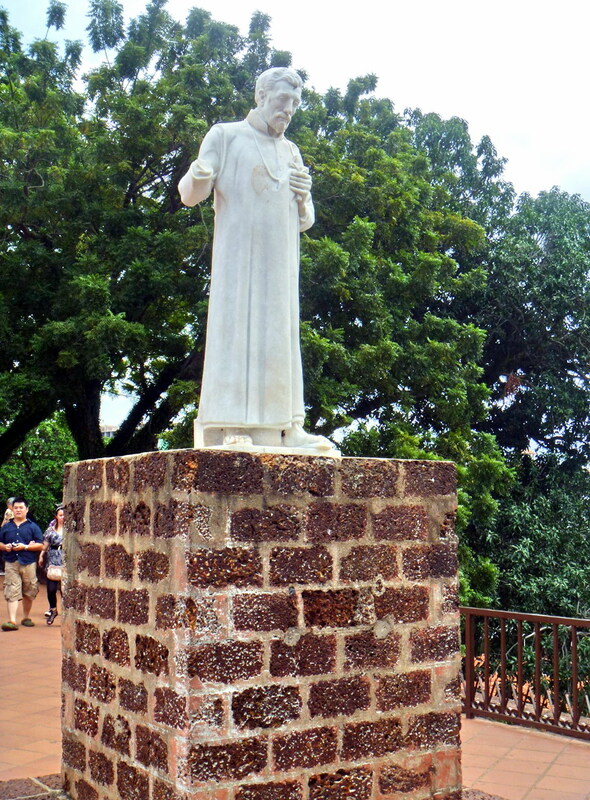 A day after the statue was consecrated, a large casuarina tree fell on it, breaking off its right arm (incidentally, the right forearm of Xavier was detached in 1614 as a relic). His now empty open grave, now covered by a wire mesh, marks the place of Francis’ temporary burial. 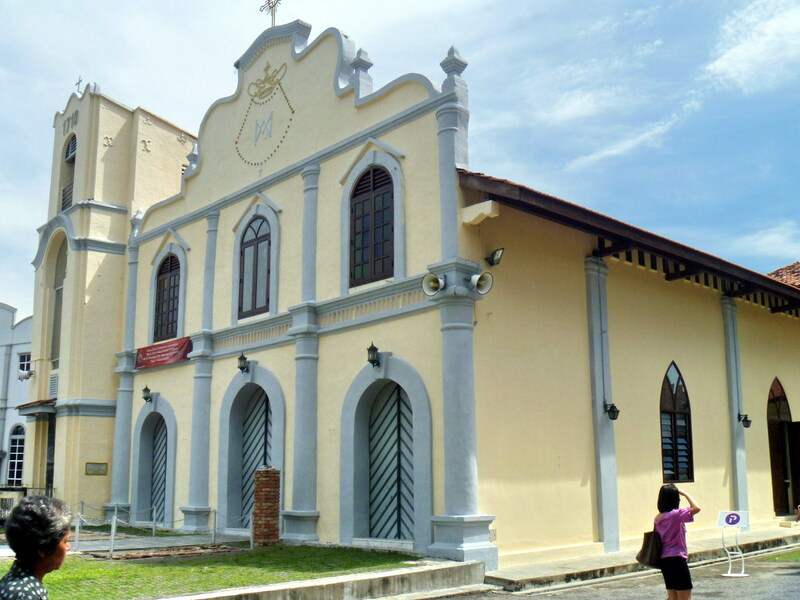 When the Dutch wrestled Malacca from the Portuguese in 1641, they took over the church, repaired it and reconsecrated it into a Dutch Reformed Church, calling it St. Paul’s Church, a name which remains today. It was used this way for the next 112 years, until it was abandoned in 1753 after the Dutch built their own church at the foot of the hill, Christ Church. 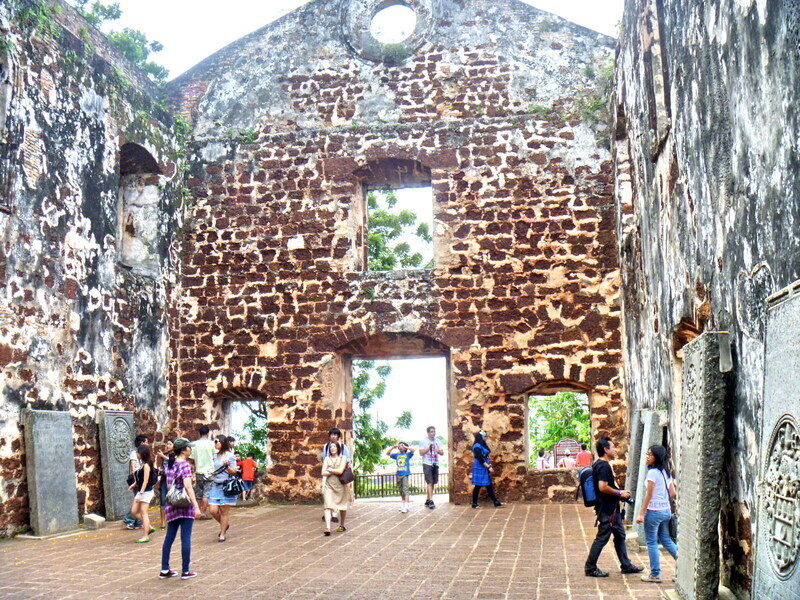 When the British took over Melaka in 1824, St. Paul’s Church had lost its tower. The British added a lighthouse in front of it and used the church as convenient storehouse for gunpowder. Today, several old monumental Dutch and Portuguese tombstones, with Dutch and Portuguese words engraved on it, can be seen leaning against the strong brick walls of the church. 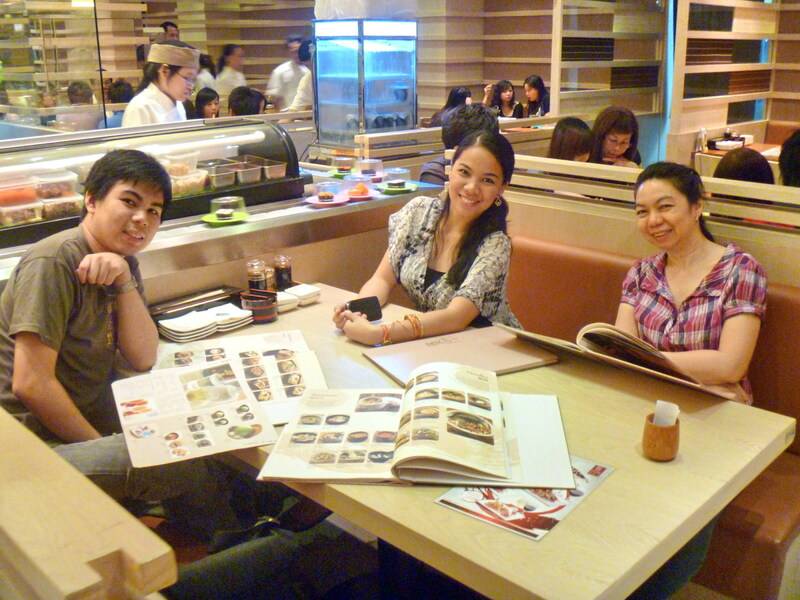 After our tour of Bukit China, we proceeded to Restoran Keng Doma for a filling 5-course lunch. Afterward, our bus next brought our group to Fort A’Famosa (“famous” in Portuguese), among the oldest surviving European architectural remains in Asia. From here, it was to be all hiking. 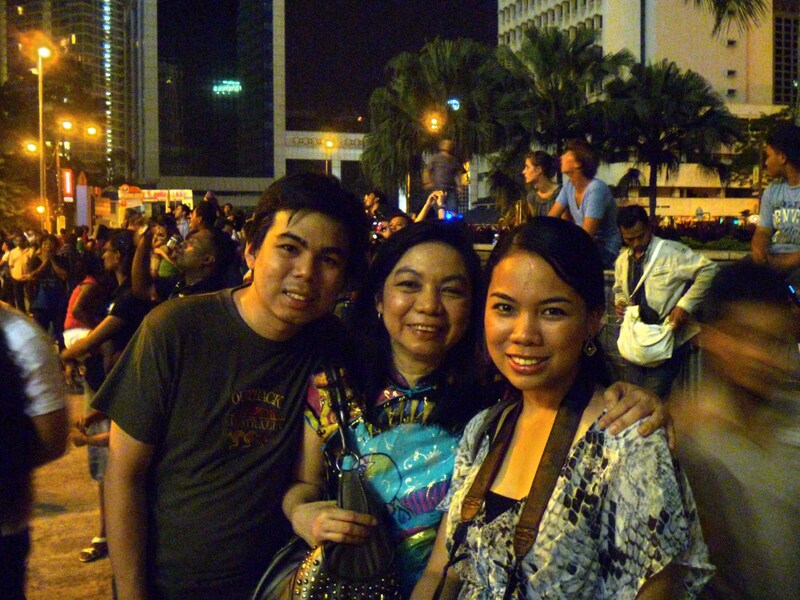 Trishaws, pedicabs decorated with bright plastic flowers and blasting pop music from speakers, are a common sight here. 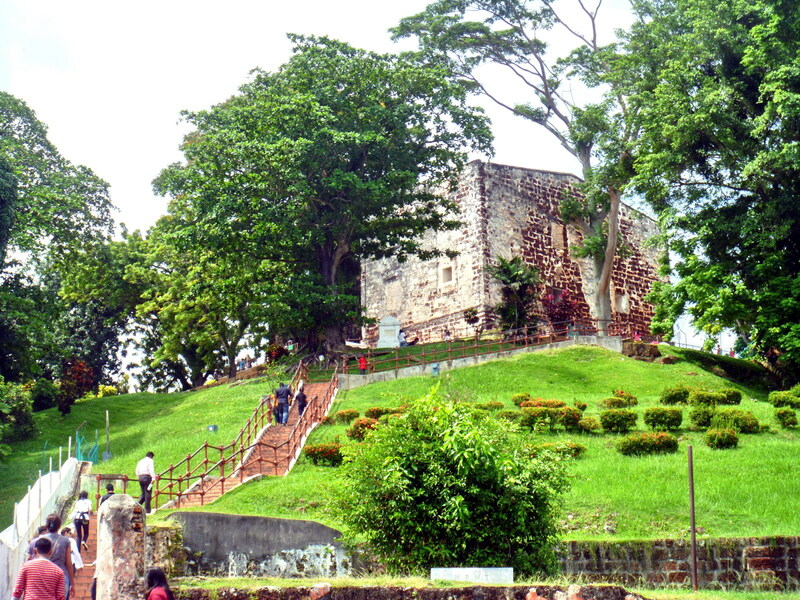 Constructed by the Portuguese in 1511, the fort encircles the base of St. Paul’s hill. It once consisted of long ramparts and 4 major towers. One was a 4-storey keep while the others held an ammunition storage room, the Captain’s residence and an officers’ quarters. Most of the village clustered in town houses inside the fortress walls. 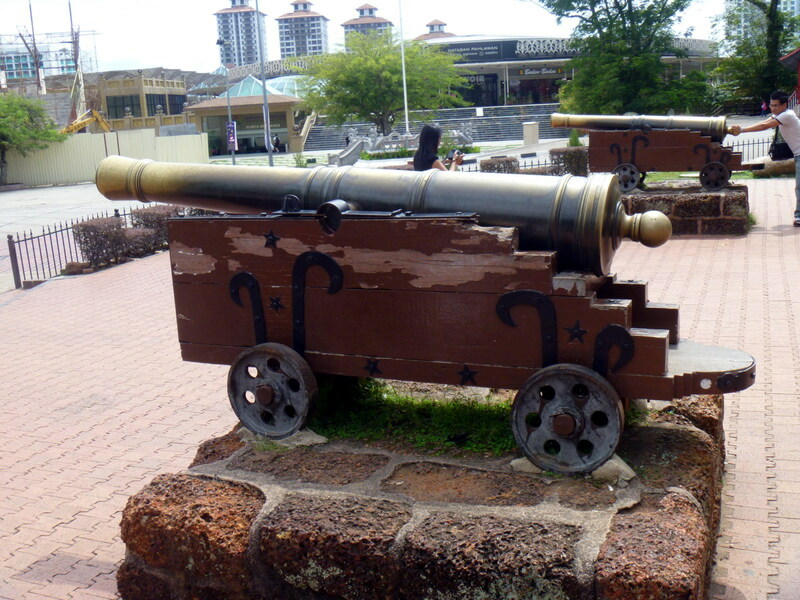 As Malacca’s population expanded it outgrew the original fort and extensions were added around 1586. 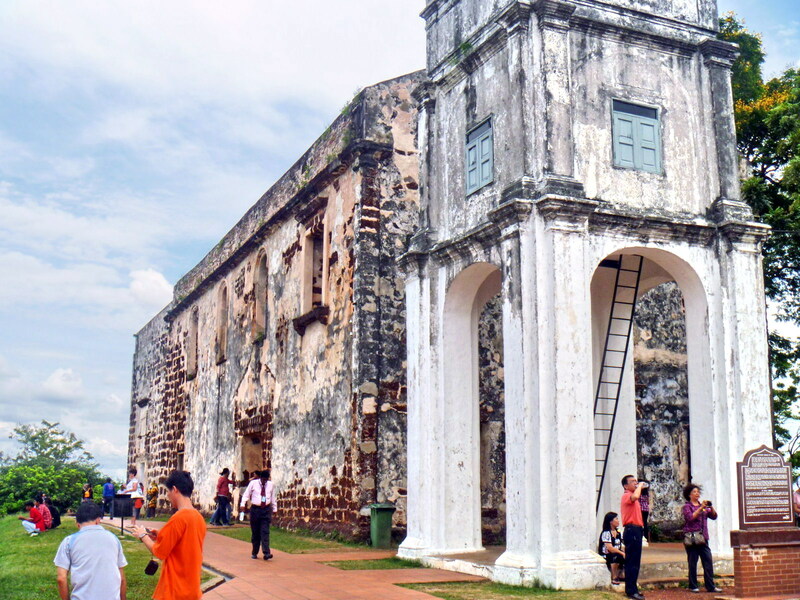 In 1641, the fort suffered severe structural damage during the Dutch invasion that successfully drove the Portuguese out of Malacca. In 1670, the Dutch renovated the gate (which explains the logo “ANNO 1670” inscribed on the gate’s arch). Above the arch is a bas-relief logo the coat-of-arms of the Dutch East India Company. In the early 19th century, the fortress changed hands again when the Dutch handed it over to the British to prevent it from falling into the hands of the French. The English, wary of maintaining the fort, ordered its destruction in 1806, almost totally demolishing it. In 1808, Sir Stamford Raffles, the founder of Singapore and a lover of history, intervened, on its behalf. 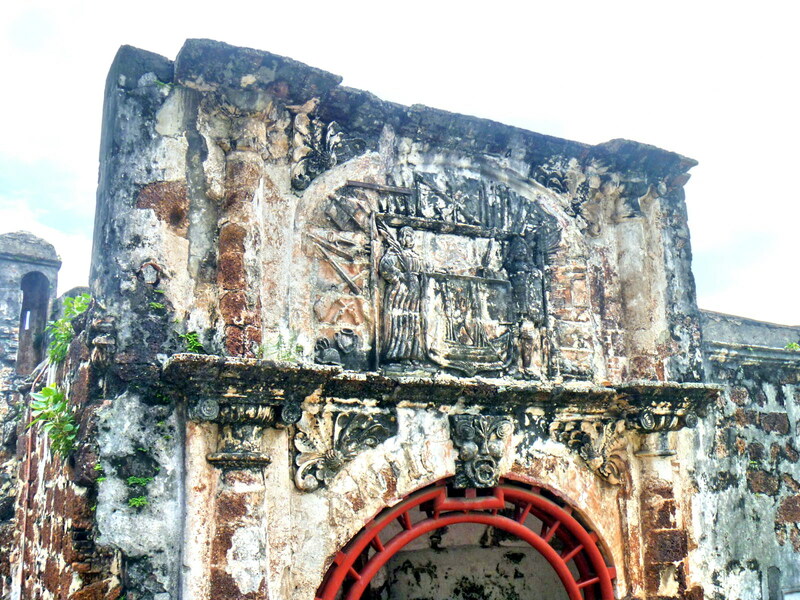 Its small gate house, Porta de Santiago, is all that remains.In front of the gate are some old cannon. 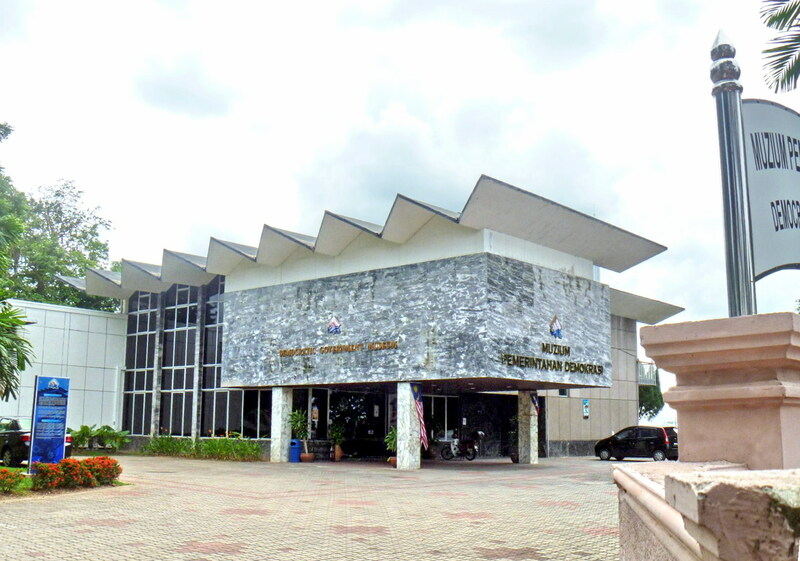 Around the area are a number of museums, all part of the Malaccan Museums Complex. 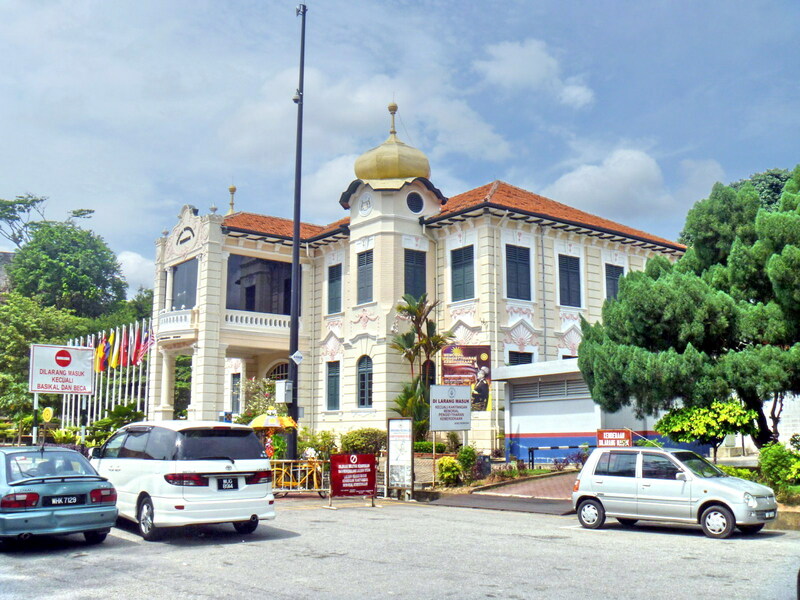 The Memorial Pengistiharan Kemerdekaan (Proclamation of Independence Memorial), located nearby, was the former club house of Melaka Club built in 1912. 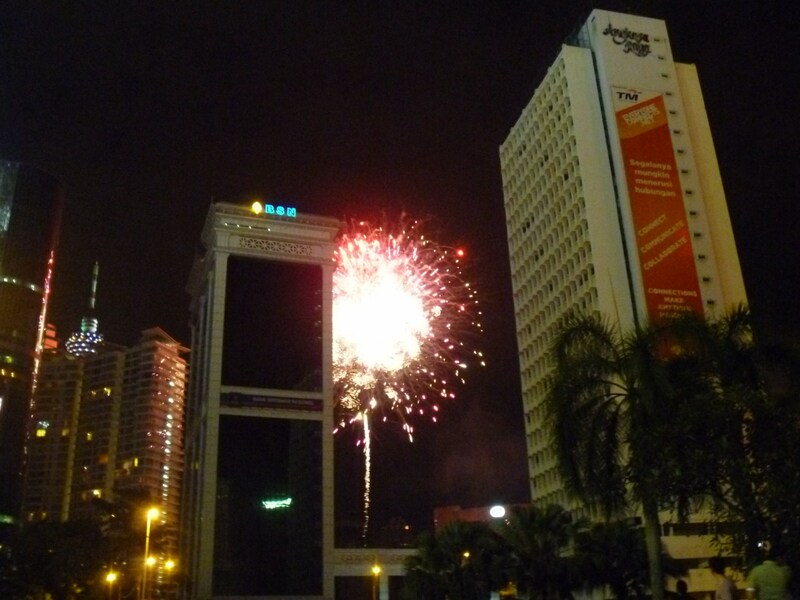 Established in 1985, it now houses invaluable exhibits of the country’s proclamation of independence on August 31, 1957 as well memorabilia and records related to the early history of the Malay Sultanate and the development of modern Malaysia. 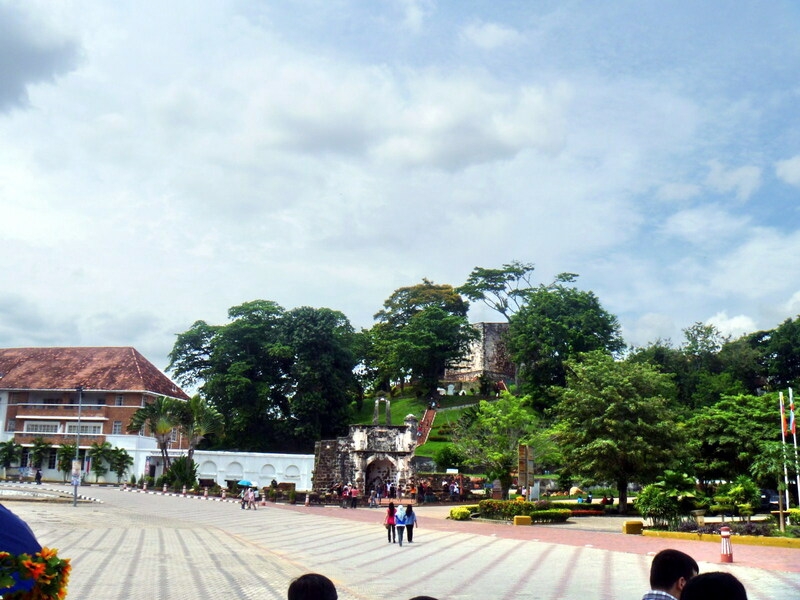 From St. Peter’s Church, our tourist bus proceeded next to Bukit China (“Chinese Hill”). Bukit China is believed to be the largest Chinese cemetery outside China, filled with 5,000 to 12,000 small and big graves with many tombs dating back to the Ming Dynasty. During the peak of the Malacca Sultanate, the Chinese Emperor gifted Sultan Mansur Shah with a princess named Hang Li Poh, the great granddaughter of the Yongle Emperor, the third emperor of the Ming Dynasty. Her vast entourage of 500 sons of ministers and a few hundred handmaidens settled here. At the southwestern foot of Bukit China is beautiful Poh San Teng Temple (translated as “Precious Hill”), built in 1795 by her ancestor Chua Su Cheong. 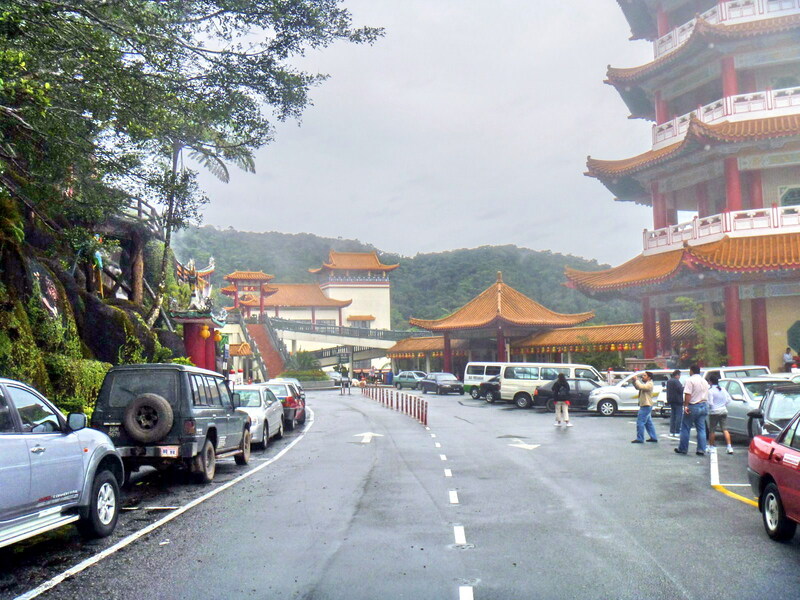 The temple is dedicated to Tua Pek Kong (also called Fu De Zheng Shen), the guardian deity of the land and of the 12,500 graves on the nearby Bukit China. 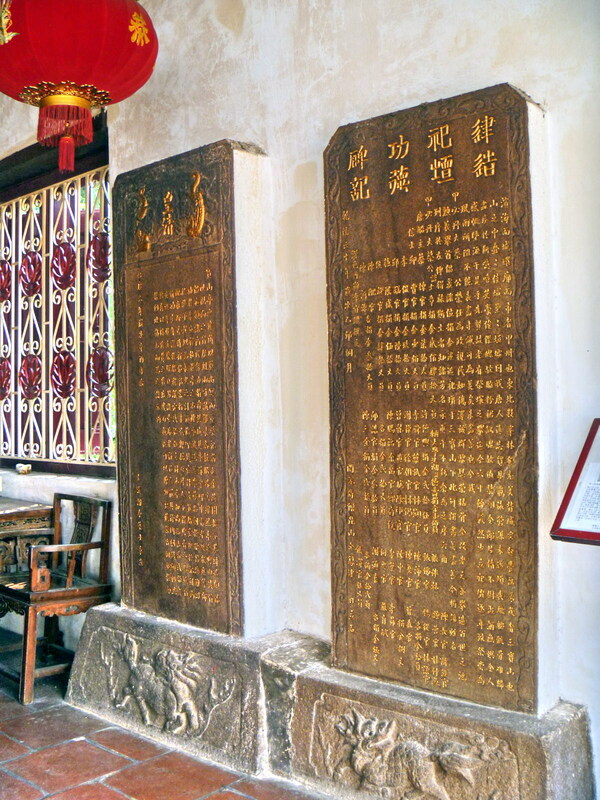 Because of its other name San Poh Kong Temple, it is often incorrectly assumed that the temple is associated with Admiral Cheng Ho (Zheng He), a Ming-dynasty navigator. In fact, there is no evidence of Cheng Ho’s involvement in the history of the temple. 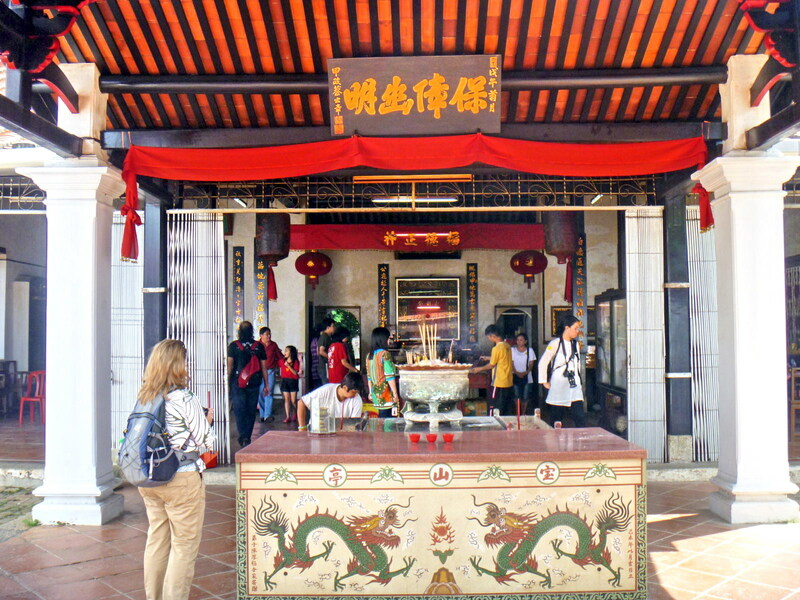 Hang Li Poh’s followers also built, adjacent to the temple’s entrance, a well in 1459 that is said to have never dried up, even during droughts. 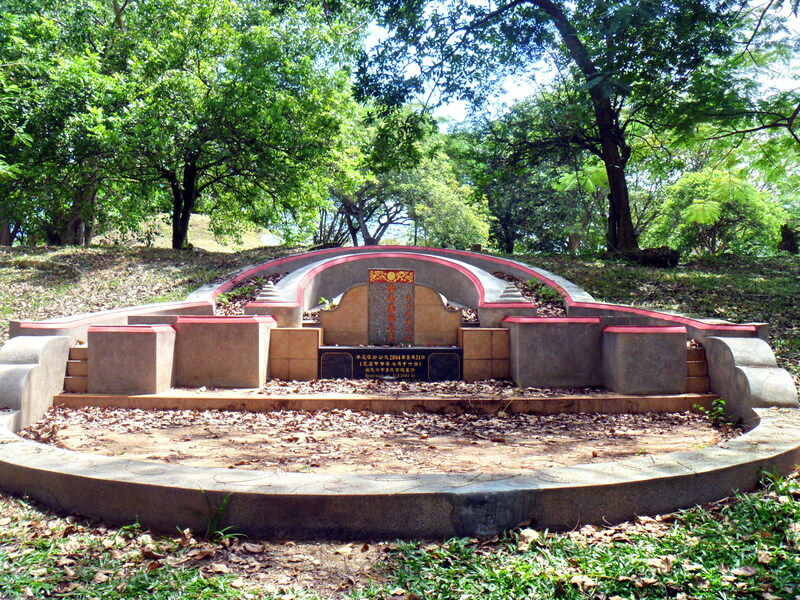 Called Perigi Rajah (“King’s Well”) or Hang Li Poh’s Well, it is believed to be the oldest existing well in Malaysia and was the main source of fresh water for the city from the 15th century onward. 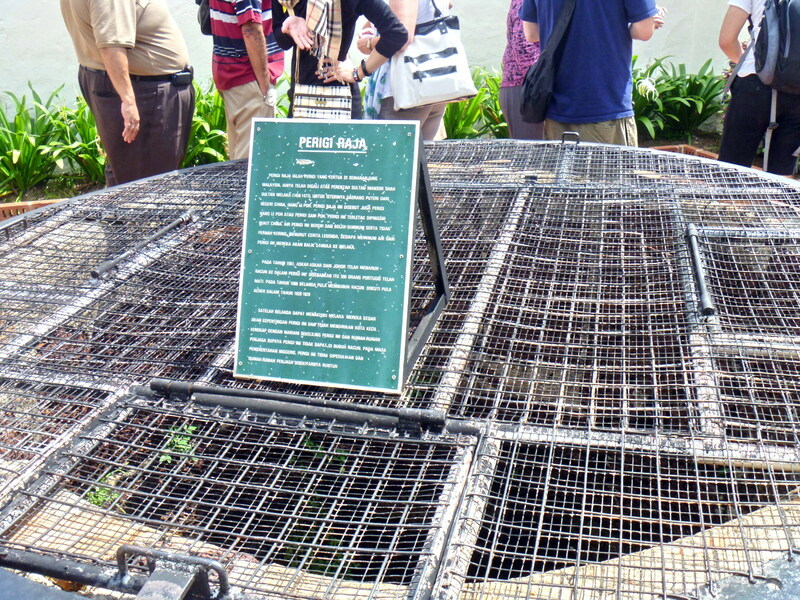 The well was later poisoned by the Sultan of Malacca causing the death of 200 Portuguese soldiers. This was repeated in 1606 by the Dutch and in 1628 by the Acheenese. Today, the well was turned into a wishing well and many believe those who toss coins into the well will return again to Melaka. After breakfast at the hotel, we proceeded to the hotel lobby where a coach was waiting for us at the driveway. Once on board, we were brought to the Pusat Jualan Kraf (Craft Sales Center) where we paid up for our Melaka day tour. We then transferred to a bigger tourist bus. The trip to Melaka took just a little over 2 hours to cover the 148-km. distance from Kuala Lumpur to the city. First on our itinerary was St. Peter’s Church, built in 1710 (after religious freedom was proclaimed by the Dutch over Malacca in 1702), during the period of Dutch rule, by descendants of the original Portuguese colonists (including descendants of the 600 men that Alfonso d’Albuquerque brought ashore after his conquest of Melaka) on a piece of land donated by Dutch Catholic convert Maryber Franz Amboer. 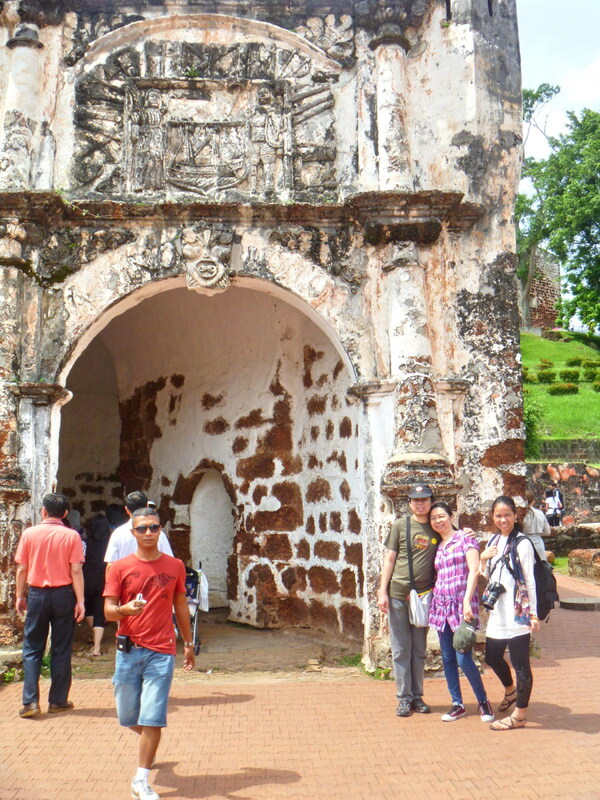 At the time this area was outside the core city of Melaka. 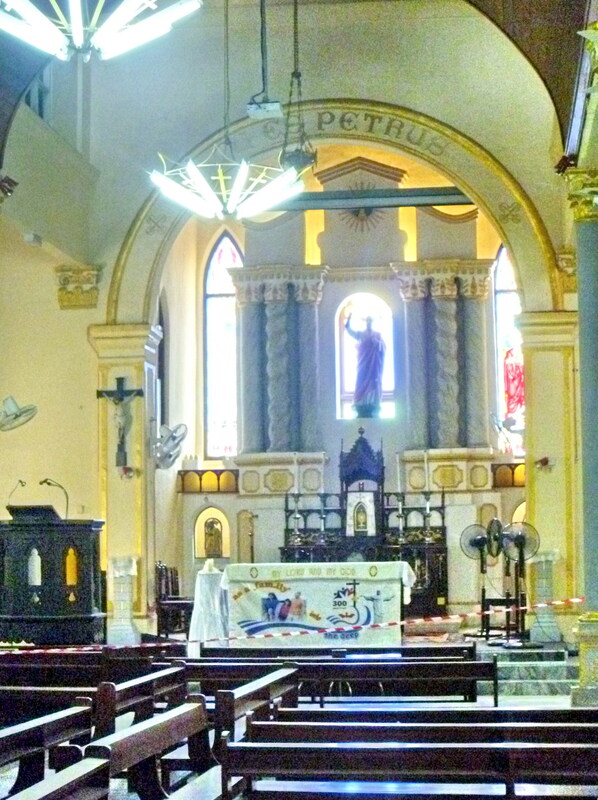 The oldest operational Roman Catholic church in Malaysia, its facade (bearing a rosary monogram) and decorative embellishment is a mix of both Eastern and Western architecture. The oldest item in the church is the bell, manufactured by Pedro Dias Bocarro in Goa in 1608 and salvaged from an earlier church burned down by the Dutch during their 1641 occupation. The bell is inscribed with the words of the Annunciation “Ave Maria Gratia Plena Dominus Tecum Beneducta Tu In Mulieribus Sancta Maria (Hail Mary, Full of Grace, The Lord is With Thee, Blessed are Thou Among Women. Holy Mary). 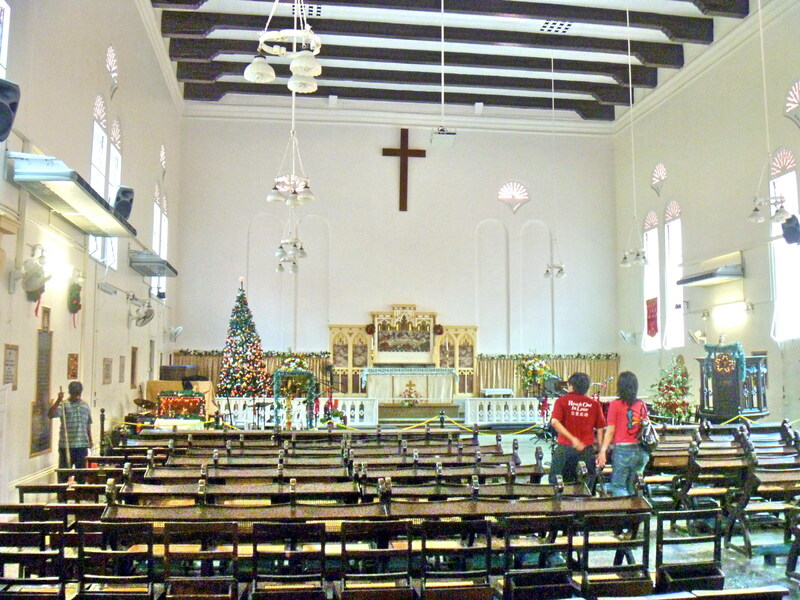 St. Peter’s Church: Gereja St. Peter, 166 Jalan Bendahara, Bandar Melaka, 75100 Melaka, Malaysia. Tel: +60 6 282 2950. Fax: +60 6-2841010. After our long stopover at Batu Caves, we returned to our van and continue along the ascending road up to Genting Highlands. 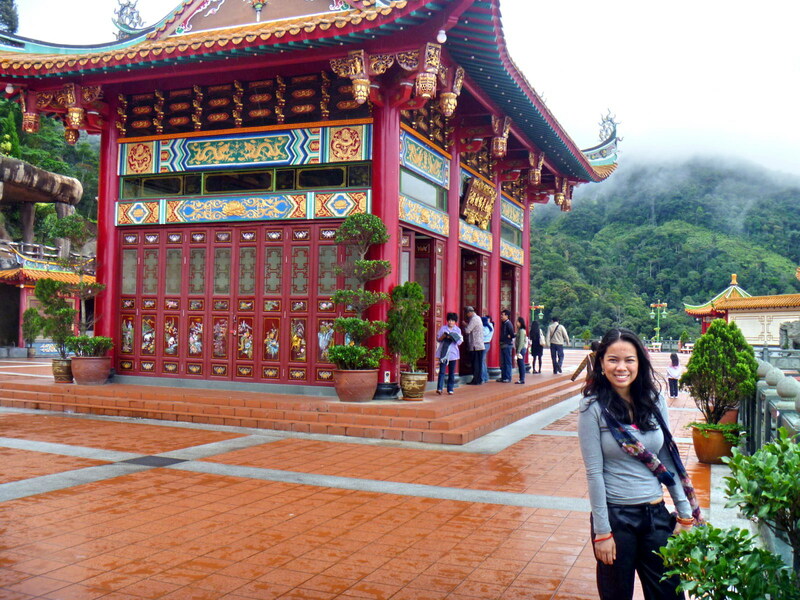 Along the way, we made a toilet stopover at the mist-shrouded Chin Swee Caves Temple. Cheska and I decided to make a short 15-min. 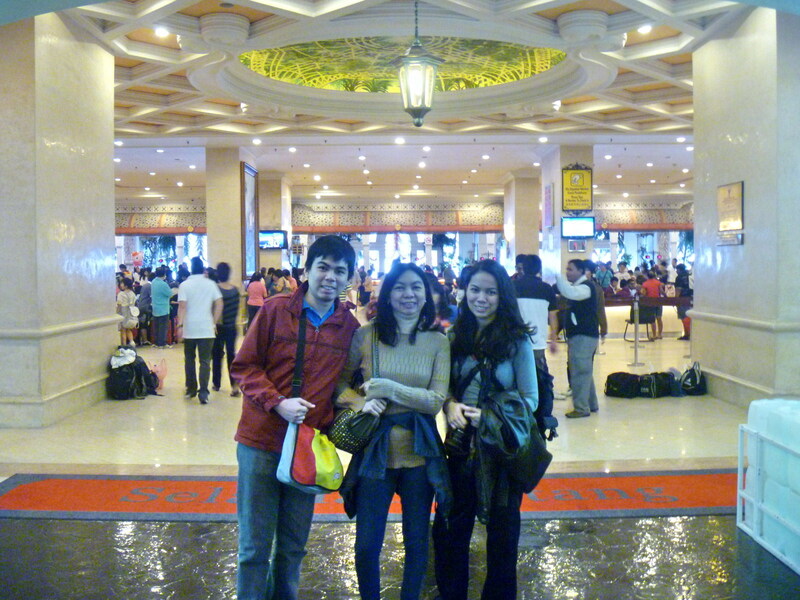 tour of the temple, wrapping ourselves in our jackets as it was very cold outside. 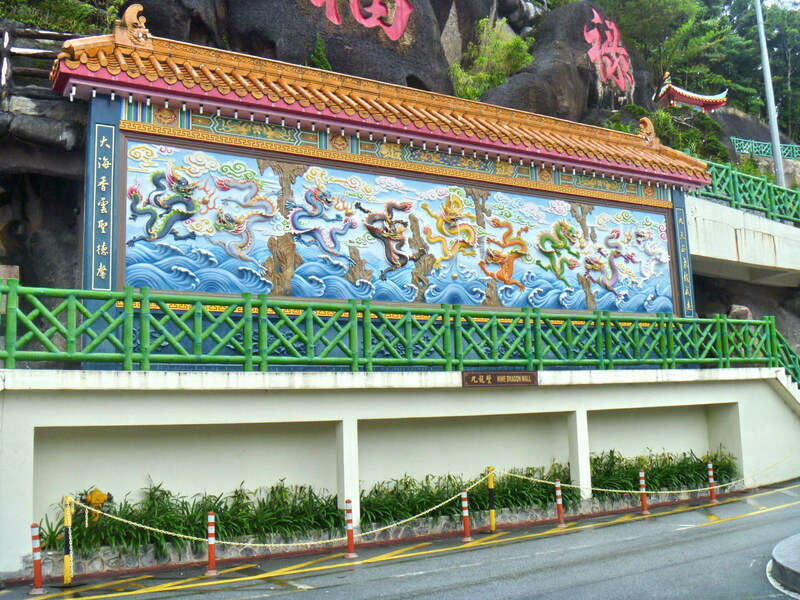 This 28-acre Taoist temple was built from 1976 to 1994 (at a cost of RM12 million) by the late Genting Berhad founder and gambling magnate Tan Sri Dato’ Seri Lim Goh Tong. He discovered this serene site (similar to the Chin Swee Crag back in Penglai Village, where Tan Sri Lim was born in Fujian, China) when he started building the first hotel in Genting Highlands. Taking 18 years to complete, it was officially opened on March 29, 1994. Just after the entrance gate is the Nine-Color Dragon Wall of Luck. It has 9 dragons, in different dispositions and shades of colors, painted on the wall. In Feng Shui, 9 dragons represent longevity. Each dragon, representing different kinds of luck, can bestow blessings on people and symbolized good fortune, vitality and strength. 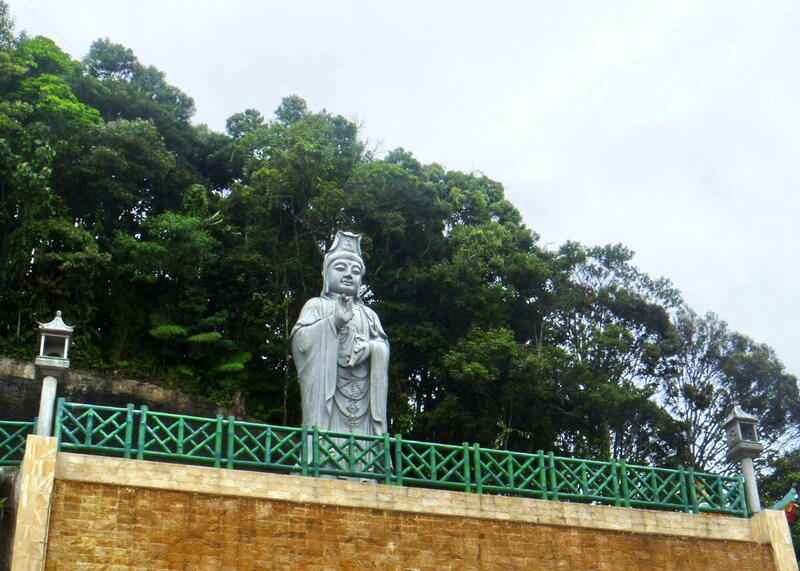 The sprawling temple complex, surrounded by lush emerald green jungle, has huge statues of a serenely sitting Buddha and a standing Kuan Yin and a smaller statue of the standing Tan Sri Lim Goh Tong. 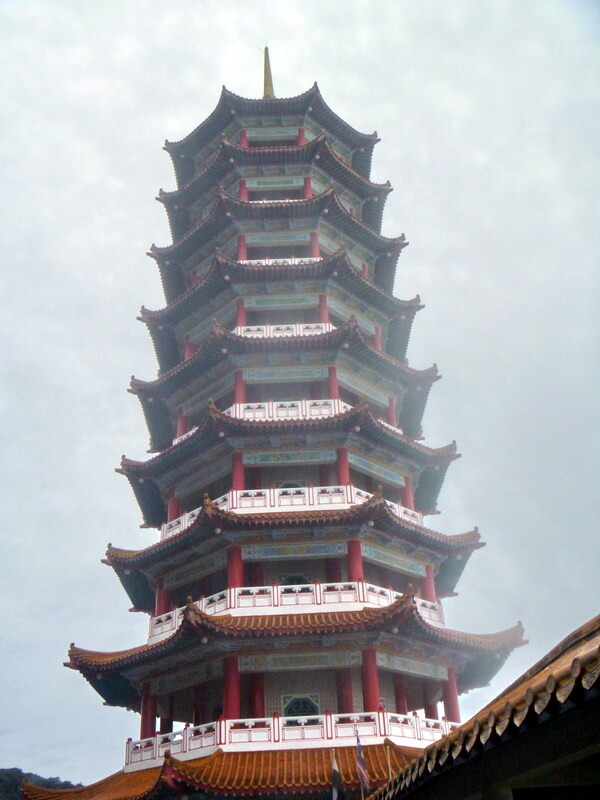 The 9-storey pagoda, overlooks the 5-storey, ornately decorated Buddhist Temple, is decorated with thousands of Buddhas covering the entire inner wall, from the ground floor to the top. There are thousands of “blessing lamps” for temple devotees to dedicate to those they want blessed by the Buddha. The aptly named Sky Terrace (Place for Heavenly Offering), a large, 35,000 sq. 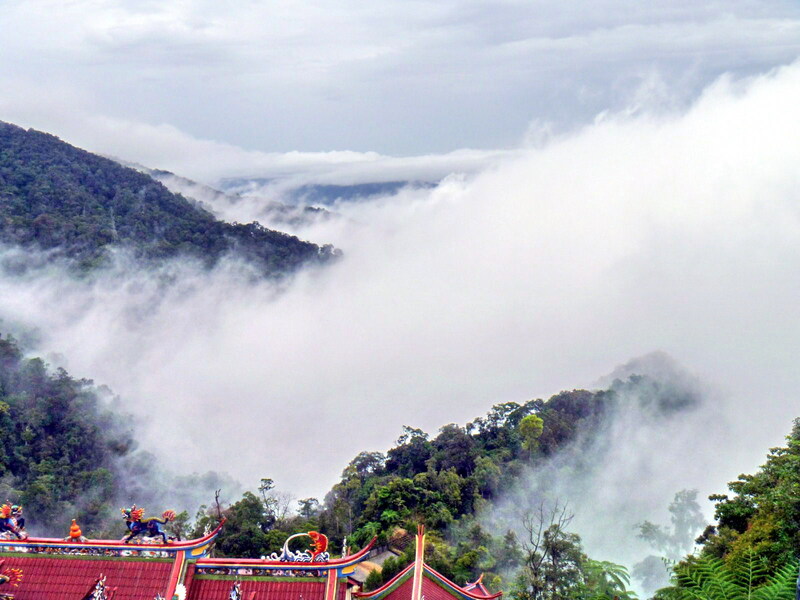 ft. square at the base of the statue of Kuan Yin, has an excellent panoramic view of the cloud-sheathed valley below and the layers of hills beyond from its observation deck. 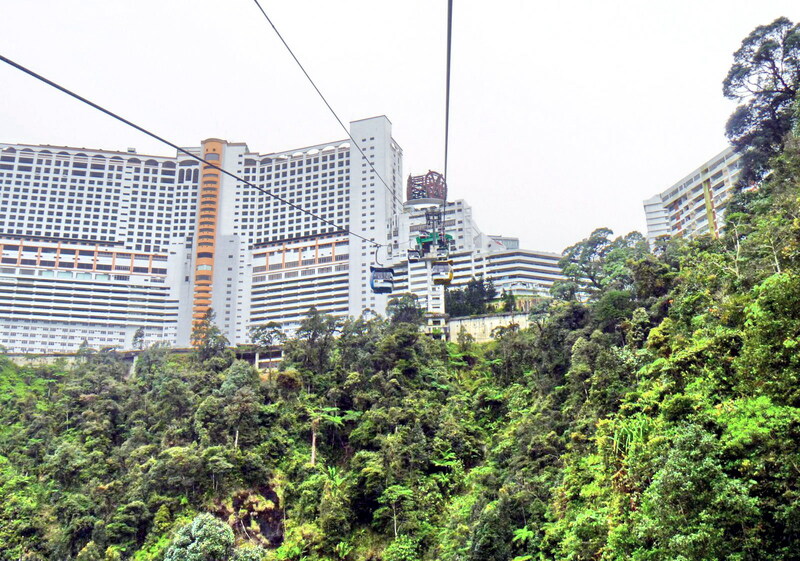 How to Get There: The temple is accessible by shuttle buses from Genting Highlands Resort or by taking the Awana Skyway cable car to the Temple Station at the bottom of the hill. 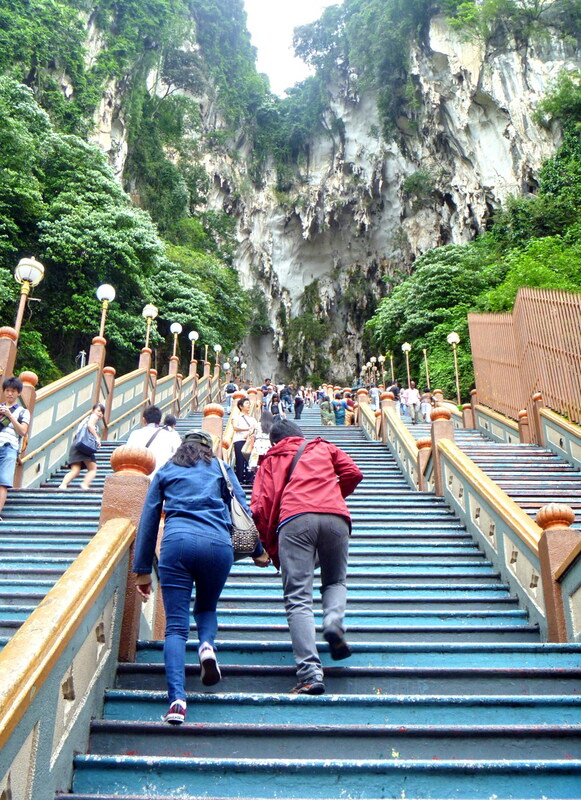 From the Royal Selangor Pewter Factory, we returned to our van and moved on to nearby Batu Caves, a series of caves and cave temples within a limestone hill. One of the most popular Hindu shrines outside India, the caves, discovered in 1892, are located 13 kms. 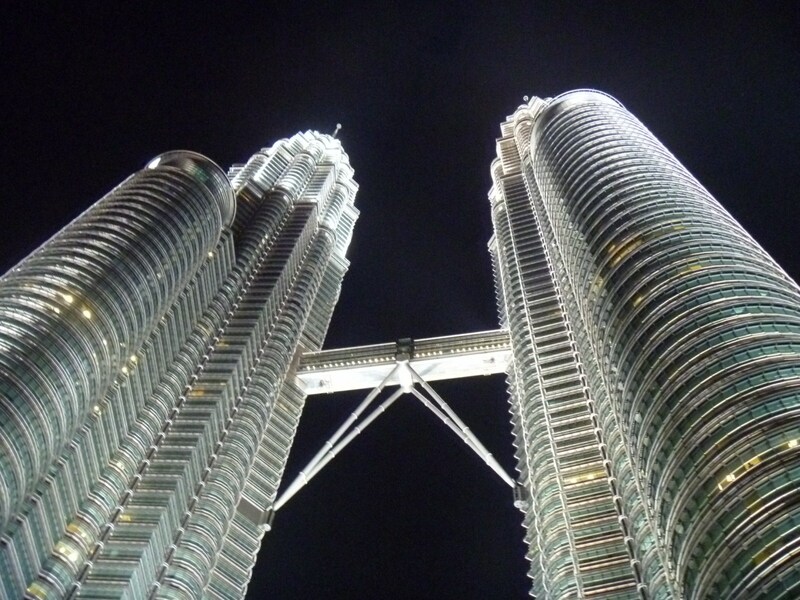 (7 miles) from Kuala Lumpur. 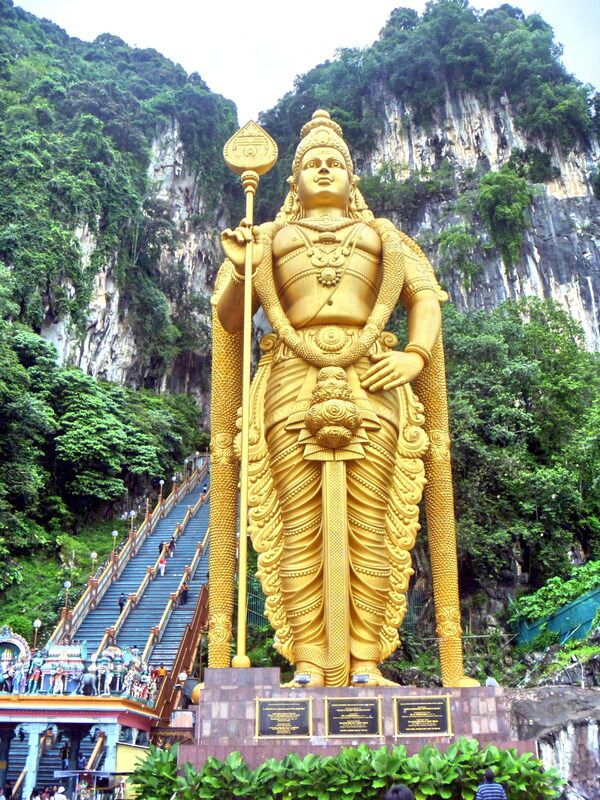 Outside the main cave is the world’s tallest statue of Lord Murugan (a Hindu deity for whom the temple is dedicated), standing at 42.7 m. (140.09 ft.) high. Costing nearly 24 million rupees, it is made of 1,550 cu. m. of concrete, 250 tons of steel bars and 300 liters (800 gallons) of gold paint brought in from neighboring Thailand. Me, Grace and my kids Jandy and Cheska all gamely climbed the magnificent but quite steep 272 steps (luckily there were landings along the way where we can catch our breath and admire the view at the same time) leading up to the 100 m. high and 400 m. long Cathedral Cave (or Temple Cave), the main cave (there are 2 others) where the Murugan Temple is located. The huge chamber is lighted by daylight from several holes in the ceiling. Along the steps and within the cave are numerous, naughty, playful and sometimes aggressive long-tailed macaque monkeys. The temple is the focal point of the colorful Thaipusam (on a full moon day between January 15 and February 14), the annual Hindu festival of repentance. 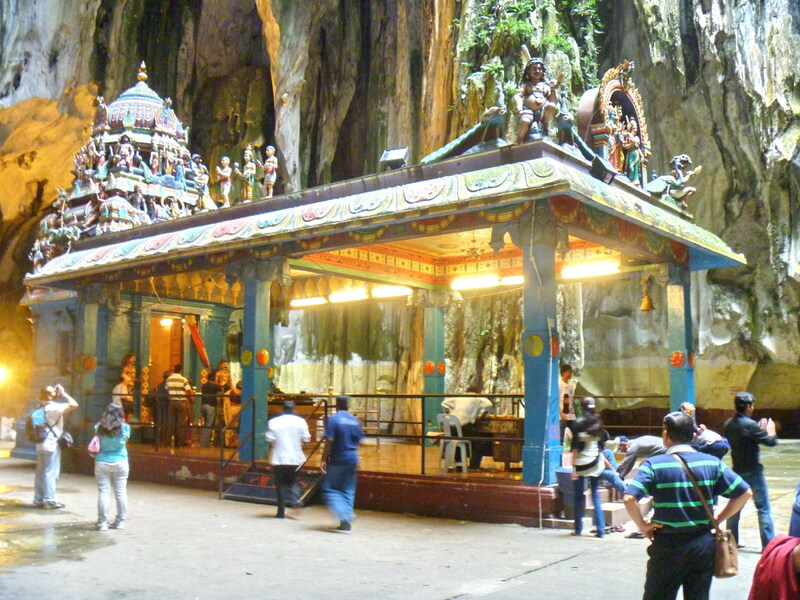 Batu Caves: Gombak District, Selangor, Malaysia. Tel: +60 3 2287 9422. 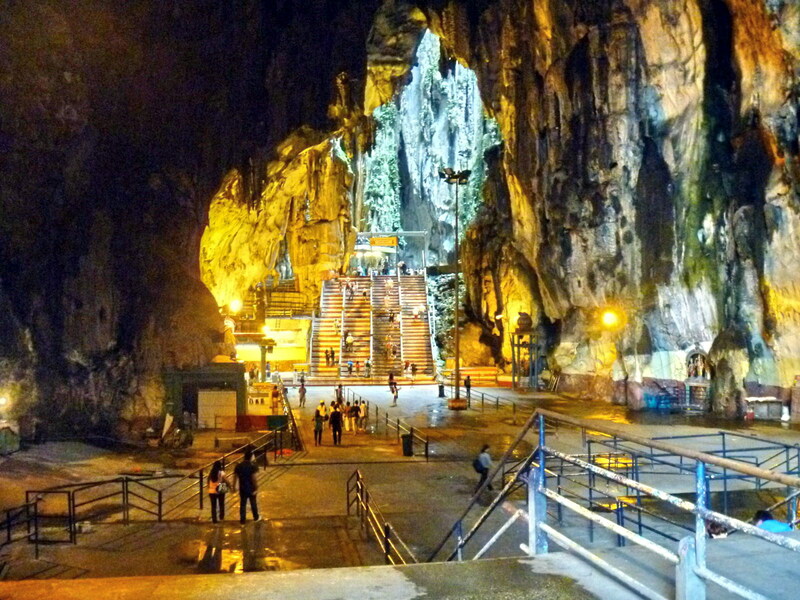 How to Get There: The easiest way to get to Batu Caves is by Komuter train (RM2.00, one way) from KL Sentral station. 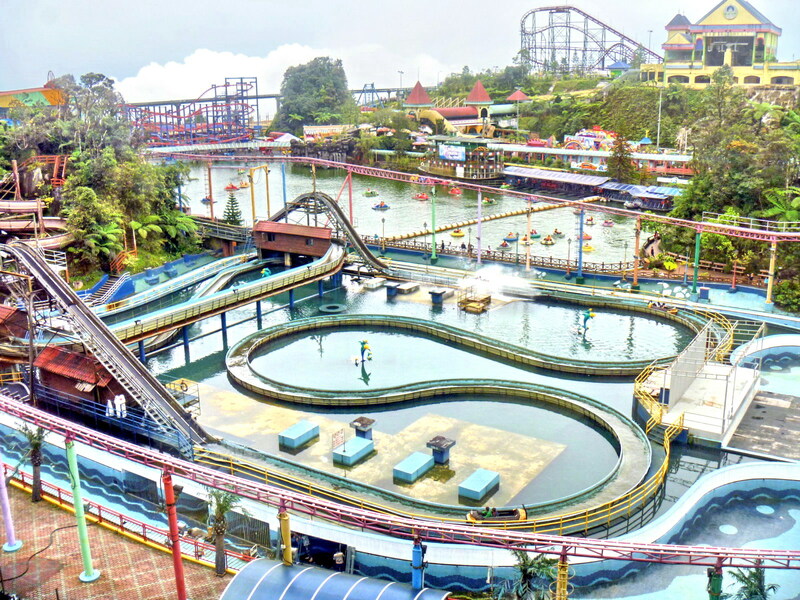 You can also take a taxi (RM20.00-25.00) from KL Sentral, the Bus 11/11d from Bangkok Bank Terminus (Near to Pudu Raya Terminus) or Bus U6 from Titiwangsa.